Monjayaki was originally eaten as a children’s treat in downtown Tokyo. The origins of this dish possibly trace back to Asakusa, a district in Tokyo. Nowadays, Monjayaki has been established as a specialty of the Kanto region. It is the counterpart to Okonomiyaki – a similar dish cooked differently and also, the specialty of the Kansai region. And possibilly, step-dad to Bakudanyaki…?? I shall stop making a mockery of food here. 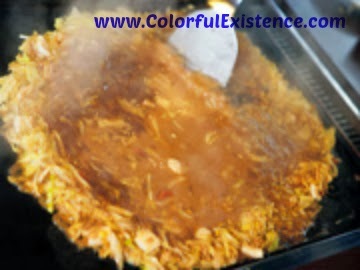 Firstly, ingredients such as dried squid, sweet corn and cabbage are heated on a cast iron plate. On the iron plate, these ingredients are gathered together – building a circular wall with a hollowed-out space. After which, watery batter is poured inside to be mixed with flour into the hollow. And finally ending by using a spatula to scrape the half-cooked part around and scooping up the cooked part – into your mouth! At present, Tsukishima – a man made island in Tokyo Bay, in the Ginza district & situated very close by Tsukiji Market is known throughout Japan as: “Monjayaki Town”.